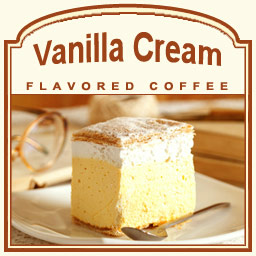 If creamy, sweet flavors make your taste buds melt, indulge in the Vanilla Cream flavored coffee. This milky, full-flavored sweetness will provide you with a vanilla bean taste with loads of creamy, soft undertones. Made with 100% authentic Arabica beans, this gourmet flavored coffee is light enough to enjoy in the morning and sweet enough to enjoy with dessert. With only 2 calories in each cup, this Vanilla Cream flavored coffee will be a treat worth treating yourself to. Roasted and shipped on the same day, your Vanilla Cream flavored coffee will be packaged in a heat-sealed bag specially made to optimize freshness. 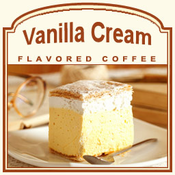 If you love creamy coffees, this Vanilla Cream flavored coffee will be completely unforgettable!